Myanmar’s Leader of Opposition, Aung San Suu Kyi, visited Beijing on a five-day tour with an aim to building ties with her country’s powerful neighbour, and also met the Chinese President, Xi Jinping. The meeting is being seen as a Chinese ploy to improve its declining influence in Myanmar in the aftermath of some democratic reforms through which the Southeast Asian country moved away from Chinese influence and toward Western Asian nations such as Japan and other potential investors who are ready to bring money into its economy. However, as a matter of fact, China is still the largest foreign investor in Myanmar, the erstwhile Burma. The democratic reforms have made citizens of Myanmar freer to protest, and consequently some Chinese projects including a dam have been stalled by people over environmental concerns. China, on the other hand, doesn’t want to weaken its hold on its poor southern neighbour as it is strategically important as a gateway to the Indian Ocean and Bay of Bengal, which China uses to secure oil and gas pipelines in Myanmar. The root of the problem between the two countries is a skirmish between Myanmar’s military and rebels along the border, which resulted in the killing of five Chinese farmers and an influx of refugees into China. 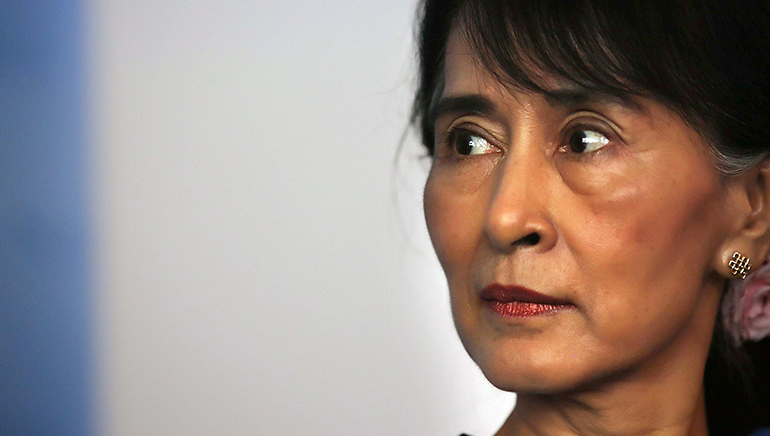 To ease the ensuing tension, China has extended its hand to the Nobel Peace Prize laureate Aung San Suu Kyi to create an image of love and peace and in contrast of China’s authoritarian hold in Myanmar. Suu Kyi, a democracy icon, was held for years under house arrest by Myanmar’s junta, the military group of Myanmar that rules the country. Suu Kyi believes that Myanmar should maintain friendly relations with China, and her recent visit to Beijing is in line with her newly created pragmatic politician and diplomatic image that she wants to project to contest Myanmar’s Presidential post. The meeting is being projected as a party-to-party meet between China’s Communist Party and Suu Kyi’s National League for Democracy, before the elections in Myanmar later in 2015. Suu Kyi also needs diplomatic credentials and support from her neighbours and other governments and leaders in general, as she is constitutionally barred from the Presidential election through a provision that citizens of Myanmar married to foreigners are not allowed to contest the highest post in the country. Suu Kyi has been campaigning for an amendment in the Constitution to allow her candidacy for the post. Suu Kyi is visiting Beijing, Myanmar’s largest and most influential neighbour, for the first time on invitation from the ruling Communist Party and is going to visit Shanghai and Yunnan province at the China–Myanmar conflict-ridden northern border. Because she is expected to visit the Chinese Premier, Li Keqiang and China’s foreign-policy-focused State Councillor Yang Jiechi, it is being assumed that the meetings are politically important as such important people of China usually meet major national leaders, not opposition party heads. Her exclusion from elections is also seen as politically motivated, as her party, NLD, is expected to win comfortably in the November elections. The elections are one of many quasi-democratic transitions in Myanmar under international pressure; otherwise its military leaders still hold the real power, some after shedding their army uniforms.